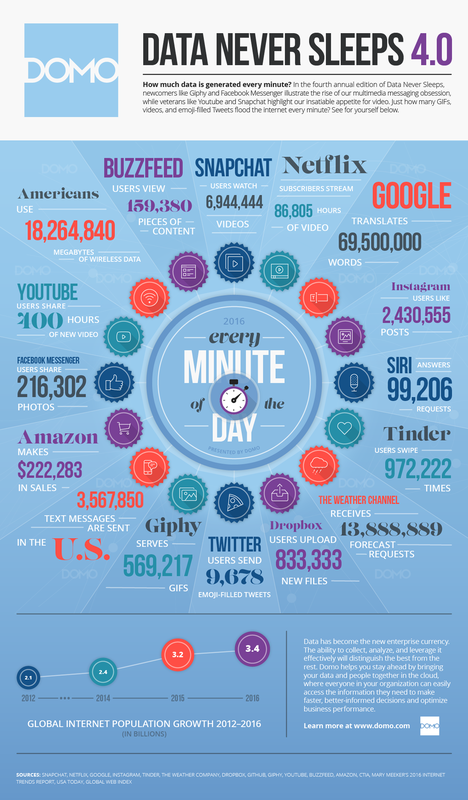 Some quick stats: 656 million tweets go out per day, and 15,220,700 texts are sent every minute. This makes for LOTS of data. Read on for more shocking stats! 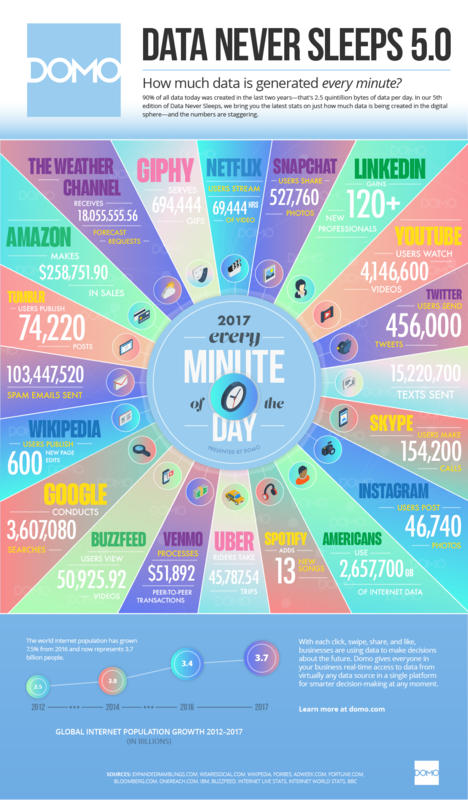 We've been tracking the growth of data created on the internet for several years, and have updated the information for 2017 to show you how much data that is being created on the internet — every day! In 2014, there were 2.4 billion internet users. That number grew to 3.4 billion by 2016, and in 2017, 300 million internet users were added — making a total of 3.8 billion internet users in 2017. This is a 42% increase in people using the internet in just three years! Social media is huge. Reports show that social media gains 840 new users each minute. 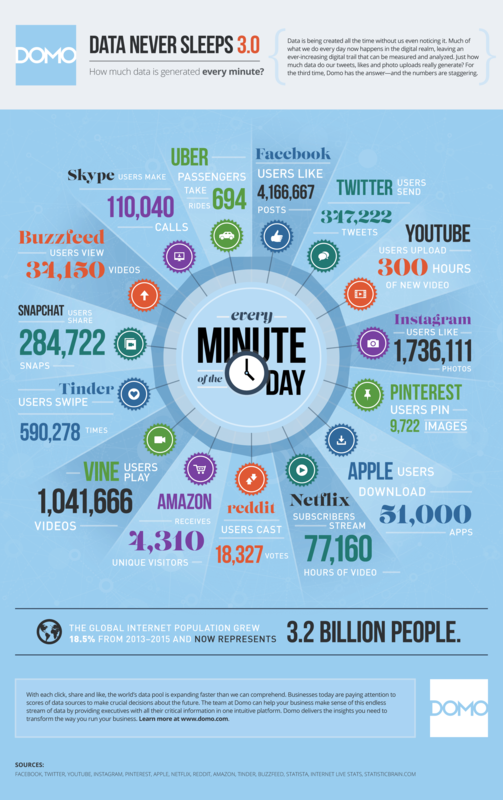 Every minute on Facebook, 510,000 comments are posted, 293,000 statuses are updated, and 136,000 photos are uploaded. Facebook users also click the like button on more than four million posts every minute! 1,209,600 new data-producing social media users each day. More than four million hours of content uploaded to YouTube every day, with users watching 5.97 billion hours of YouTube videos each day. There are over two billion monthly active Facebook users, compared to 1.44 billion at the start of 2015 and 1.65 at the start of 2016. Facebook has 1.32 billion daily active users on average as of June 2017. Don't think that with these increases in social media, email is going away anytime soon! Email use continues to grow. The Email Statistics Report 2017-2021 by the Radicati Group confirms this. 269 billion emails are sent daily in 2017, and this is expected to grow by 4.4% yearly to 319.6 billion in 2021. The amount of mobile data is also blowing up. At the start of 2014, mobile phones/tablets uploaded and downloaded around 2 exabytes (1 exabyte = 1 billion gigabytes) of data. At the start of 2017, data created on mobile devices quadrupled to over 8 exabytes. At the start of 2017, there were 3.394 billion mobile internet users. This means that in 2017, there are more mobile internet users than desktop internet users, with mobile being used to access 51.4% of web pages and desktop to access 43.4% (tablet is used for 4.9% and other devices for the remaining). Devices are a huge source of the 2.5 quintillion bytes of data we create every day — not just mobile devices but also smart TVs, cars, airplanes, you name it — IoT is producing an increasing amount of data. IDC forecasts a 31 percent growth in wearable devices from 2016-2020. There were 28.3 million wearable devices sold in 2016, which would mean 82.5 million in 2020. Pratt & Whitney’s Geared Turbo Fan (GTF) engine is fitted with 5,000 sensors and can generate up to 10GB of data each second. Uber is releasing six years of transportation data to cities to help them plan public transit. Business Insider predicts that by 2020 75% of cars will come with built-in IoT connectivity. Amazon is dominating the marketplace. Amazon processes $373 million in sales every day in 2017, compared to about 120 million Amazon sales in 2014. By the end of 2016, Uber had 40 million monthly active users. Venmo processes $74.7 million in transactions every day. Published at DZone with permission of Jeff Schultz , DZone MVB. See the original article here.